To those in need of roofer’s fall protection, come view our selection at National Ladder & Co. for our wide variety of fall protection products, now being offered with FREE shipping anywhere in the U.S. We sell Miller’s full line of fall protection products, including their roofer’s fall protection kits. Miller is a brand that you can trust with your workers’ safety and to increase productivity. 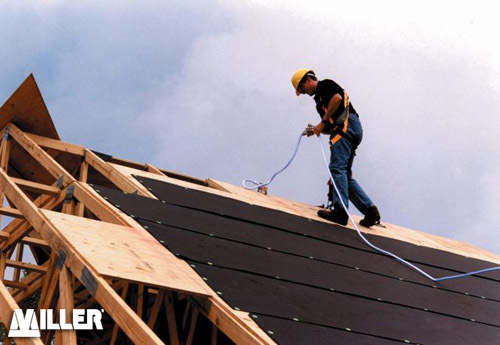 We care for the safety of you and your workers on your next roofing project, which is why we trust Miller to provide the safety that you deserve to get the job done. These kits include self-retracting and roof mounting lifelines with rotating brackets. These are the ideal lifelines for a variety of roofs, so the kits are very versatile. The hardware that comes with the kits can be used for wood roofs and metal decking. National Ladder & Scaffold Co. opened in 1935 as a family owned and operated business in Michigan. Through the years, we have stayed true to our homegrown ideals by giving customers a wide variety of products for all their contractual needs, at the best prices available. We have two locations in Michigan as well as an online store, so you can order from us at any time. We offer to ship anywhere for some of the most reasonable shipping options available.